This is the first of a series on Chinese Sword Fighting Techniques. It helps to know the basics before learning specific techniques. Thrusts are common to many sword fighting styles. This page is about three main thrust sword techniques from the Yangjia MiChuan Jian system. I’m loosely calling them all thrusts because they are all movements that use the tip of the sword with penetrating force. As with everything in this Chinese Swords Guide, I’m sharing my understanding as a seventh year student of Chinese swordsmanship. Those who look for more advanced knowledge should find a qualified teacher. My teacher, Scott Rodell, has written a book on this subject called Chinese Swordsmanship: The Yang Family taiji Jian Tradition. Australians can get it from me, and those closer to America, from Seven Stars Trading Co.
All straight sword styles use sword techniques similar to this. Ci is used as a penetrating thrust with the tip of the blade. It usually aims at something vital such as the heart, throat or an opening in the facial armour. Ci is more likely to go forward with the blade turned so the flat is horizontal. This would depend on what you were aiming at, or through. It is a fairly committed sword movement, aiming to penetrate deeply enough to finish an attacker. Let’s try it. Stand in basic jian stance. Your back foot is “rooted” to the ground. The energy for the thrust comes up that rooted leg and is directed through your waist, out through your arm, which is extended by the sword it is holding. Your whole body backs the thrust, not just your arm. In basic stance, you are “sitting down” into your back leg with the knee bent. This means your body is lowered, giving it space to spiral up as you stand up, extending into the thrust. Your waist (actually your whole hip area), turns away from the direction the sword is going, to a 45 degree angle, powering the thrust. Your hand turns to a palm up position, turning the blade flat. The turn of the wrist should be completed before the tip strikes its target. At the extent of the thrust, some of the weight from the back leg will have transferred to the front, although the heel of the front foot never connects with the ground. It’s about a 30% weight transfer. Your other hand, that rests in sword talisman position at your wrist, acts at the same time. It could rise up overhead to stop in front of and above your head, on a line with the offside eye. It stops there just as the thrust reaches it’s full extent.Or, it could be further back behind you if you are reaching into the thrust. The whole movement is a bit like a corkscrew with your body spiralling up, then down again, as you sink back to basic stance. Try several in a row, feeling the spiral up, spiral down effect. This thrust isn’t always straight ahead. There are variations on all of our sword techniques. ci can angle upwards or downwards, connect with the opposite straight on or from the side. When you have this thrust correct, with everything happening together and no disconnected movements, there are many ways to use it. You can do it with a step, or a double half step, with a lunge, a one legged stretched out thrust, etc. I used to practise hitting small objects, or going through small gaps with my sword. After you practise these sword techniques 10,000 times each, half with the right hand and half with the left, you get quite good at precision …. no, I’m not kidding. Just don’t do them all at once or you’ll damage ligaments. Dian is one of the most precise of the sword techniques I’ve learnt. It is a downward pointing movement. Dian is not meant to penetrate as deeply as Ci. It’s used to cause damage that can be followed up by another cut, or to disable. You can aim at the top of a knee, a main leg artery, a thumb ligament or some other small disabling target. It snaps in and out rather than driving in. The body mechanics for Dian are the same as for Ci. There is the same spiralling up movement with the whole body moving in unison. there is the same channel of energy from the rooted rear leg through the waist and out through the sword as an extension of your arm. There is the same transfer of weight, from all in the rooted leg, to about 30% of it in the front leg at the end of the thrust. The sword talisman hand moves to the same position out from and above your left eye.Scott Rodell voids Michael Mock’s Dian. The difference in this sword technique is the direction of the thrust and the amount of energy. A Dian points downward. The thrust energy is shortened somewhat by the fact you are spiralling up and standing up as you do it rather than pushing down with your whole body. It is also shortened by the Dian being more of a quick turn of the wrist. The energy is still downward, but quite short in penetration compared with the Ci. My favourite place to practise this sword technique is on a tree down the backyard. A dead branch was sawn off years ago and it’s at just the right height and angle to aim my Dian. It has a surface area about 6cm in diameter. I need to look for something higher that acts as a thumb ligament practice spot. Zhao is harder to explain. You can do it standing off a back foot or stepping off a front foot. It is another downward movement – more of a poke downward this time and somewhere between a Ci and Dian for energy. One good target for the Zhao is the opposite’s shoulder. Your hand will be high with the sword angled down for this one. Try it by standing in basic jian stance and turning your wrist over so the fingers are to the outside and the sword is upside down. You can do it from the right or left side of your body, straight ahead, or on an angle. It is good to follow with this thrust after a high deflection or a rising cut. You can step into it as a follow on from a pommel strike which knocks your opposite backwards, or when taking another step forward out of a stretched out Ci that didn’t quite connect. There are many possibilities. This thrust is often a surprise because your hand doesn’t look in a good position to follow on. Zhao can be practised from a static position, side to side. This is a really good exercise for practising turning the waist and pivoting on the front foot. To do it successfully, you will need to sit right down on your rooted leg and open from between the legs as you spiral down to the tight side. You can also train this sword technique with a step. Step forward with the opposite leg to your sword arm and bring the sword side leg in a short step behind the front one (with lateral distance getaway room, of course), as your thrust connects, it uses the power of your whole body. In Dao swordsmanship, this step is called a suibou step, so if you already learn Dao, you might know what I mean. When you use Zhao, your sword talisman hand circles up the front to point at your wrist or the forte of the sword. It acts like a brake, stopping the movement of the sword before it goes down too far. When I say stopping, I don’t mean it touches the sword. The stopping is almost a mental effect as the momentum of both hands finishes together. 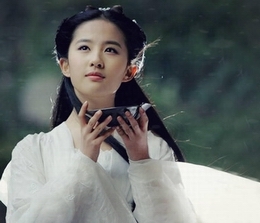 Make sure you get your angle correct for Zhao. It needs to connect with the opposite’s shoulder. If the angle is too steep, you will miss. I loved practising this sword technique with a pointed wooden sword. I hung a plastic bag full of other old plastic bags, from a tree branch. There is something very satisfying about stabbing into your target. When one of the bags had too many holes, I took another one out of the stuffing and made it the new outside. My target lasted for many hundreds of practice cuts. Hi, I’m not sure who wrote this page (perhaps Jason? ), but I can tell you about the picture, since I took it. 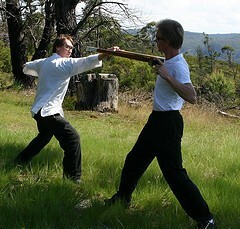 It was taken in Blackheath, Australia and this is my teacher, Scott M Rodell, and my friend, Sifu Jason King. They are doing a bit of free swordplay and the technique Laoshi is using is Mo to deflect the sword, while moving into Ci. For those who do European styles, it’s a thrust at opposition. This is one of my favourite techniques.